The average Australian produces nearly 650kg of waste per year. In order to reduce this amount, we need to think about specific ways to combat mindless wastage. I started to cut down on unnecessary plastic around a year ago; I realised that my laziness and ignorance was excruciatingly damaging to the environment. So, who generates the most waste? Not surprisingly, highly developed nations account for 44% of the Earth’s waste. The United States, China, Brazil, Japan and Germany are the leading trash generators. Thankfully, Australia isn’t in trouble. The U.S, however, produced about 228 million tonnes of waste in 2006; a figure that climbed to 254 tons by 2013. China (with a population around four times larger than that of the U.S.) is close behind, with 190 million tonnes of waste per year. Number One – Reduce your daily waste. One of the easiest ways to reduce waste is to use reusable bags, water bottles and coffee cups. This step requires little to no effort. Reusable Bags: Woolworths is currently giving out 3.2 billion lightweight plastic bags per year. Keeping reusable bags in the back of your car can ultimately reduce a massive amount of waste in the form of plastic bags. These reusable produce bags are also super convenient for fruits and veggies. Reusable Drink Bottles: Worldwide, nearly 3 million tonnes of plastic are used to bottle water every year. Simply buying a stainless steel drink bottle allows you to refill and wash your bottle regularly – think of all the plastic bottles you’re saving from going to landfill! Reusable Coffee Cups: Believe it or not, paper coffee cups can’t be recycled properly. 500 billion disposable coffee cups are produced globally each year. Australia uses 1 billion of these, and 90% end up in landfill. 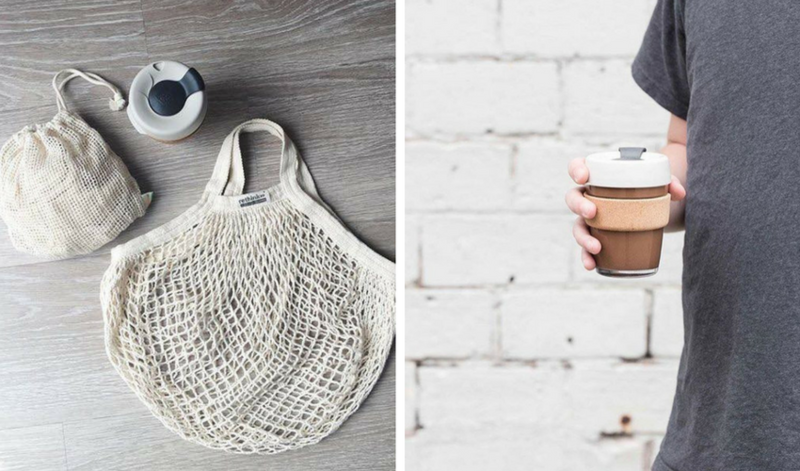 These KeepCups are the best way to reduce the waste from your morning coffee. Number Two – Avoid buying for convenience. According to Food Wise, Australians discard up to TWENTY PERCENT of the food they purchase. Crazy, right? On a slightly larger scale, Australians waste FOUR MILLION tonnes of food per year. Cooking at home: Our food waste is rising at a rapid rate. One of the best ways to reduce waste is by sourcing whole, local ingredients to make your daily meals. Wherever possible, buy in large quantities to avoid excess waste. Avoiding single-use items: Disposable utensils, individually wrapped items and single-serve containers are simply crafted for a quick fix or convenience. Take five extra minutes in the morning to pre-pack your lunch – you’ll save money in the long run. Number Three – Reduce, Reuse, Recycle. We’ve all heard it. Sometimes we forget, and that’s okay. Reduce: Avoid unnecessary purchases! Buy only what you need. Reuse: My pantry has changed drastically since I started reusing glass jars. Start with pasta, grains, nuts etc. – over time you’ll put anything and everything into cute jars. Trust me. Recycle: The big one – and by far the easiest to follow. Recycling is an important factor in conserving natural resources and greatly contributes towards improving the environment. Many materials can be recycled, such as paper, plastic, metal and glass. Did you know that around 66 percent of energy can be saved by producing plastic products from recycled plastics instead of virgin materials? Think twice before you throw out that tub of yoghurt. The reality is that we, as individuals, truly have the power to make a change. Through being mindful of what we consume/purchase, each one of us can play a part in saving our planet. Previous Putting Stress Into Perspective. Next ‘No fear, no pain’: What really happens to livestock when they leave Australian shores?